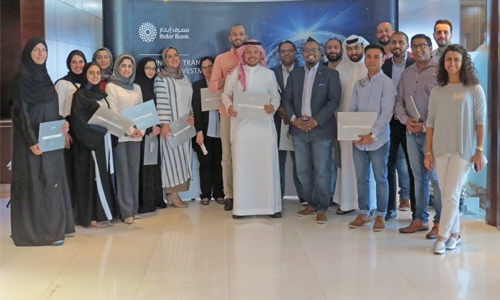 Manama : Wholesale Islamic Investment bank, Ibdar Bank, has announced that 22 employees have successfully completed a weeklong intensive FinTech in-house training programme held recently at the Bank’s Manama Headquarters. The “Understanding FinTech” programme introduced participants to the world of Bitcoin and other cryptocurrencies, in addition to the underlying technologies and their application in the financial services industry. The course, which was delivered by a leading learning and development organization in the UAE, KSA and the EMEA region, is aligned with the Bank’s strategy to digitally transform its operations in order to cater to the needs of a Global Islamic Digitized Economy (GIDE). The Bank recently announced its founding membership of Bahrain FinTech Bay in addition to its plans to develop its advisory capacity with regards to financial products for the digital economy with a strong emphasis on fully digitalized products for the Blockchain economy, Cryptonomics and their deployment in the public and private sector.